UNIQUE. BRIGHT. HISTORIC. 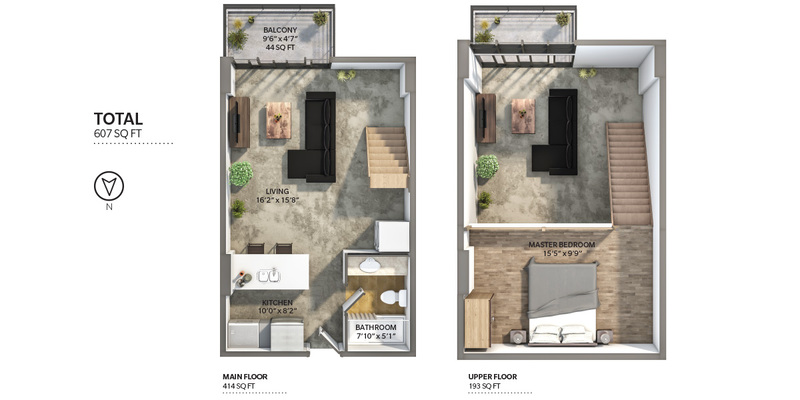 This double height gem at the Van Horne is loft living at its finest! There's the soaring 15'3 overheight ceilings, a huge wall of floor to ceiling windows, and an industrial edgy vibe thanks to the distressed concrete floors. The freshly renovated kitchen features glossy white cabinets, an oversized sink, stainless steel appliances and Caesarstone countertops. There's also a south facing balcony with great urban views. Upstairs you'll find the master bedroom with warm wood accents which overlooks the open-concept space below. Practical features include insuite laundry and parking, while you'll find all that Gastown has to offer right outside your door. You'll be just steps from some of the city's best bars, restaurants, shops, and cafes. Pet and rental friendly! You will be notified by email when the The Van Horne building has future listings.